Before signing up to an operator, what do I need to do? Before signing up for satellite or WIMAX services, you should make sure that there is no public project lined up for your town or village. Make enquiries with the town/village council (mairie). How can I find out how long my line is? Either online at www.degrouptest.com, or by calling the Orne Digital Masterplan Taskforce. I don’t know what bandwidth I need. Who can I contact to help me choose the right operator? The operators can inform you about their services. It is up to you to compare their offers with your requirements and your budget. Orne Council cannot guide users towards any particular operator. They are there to help you find out which technology you are eligible for: ADSL, WiMAX, WLL or Satellite. I know that there’s an optical fibre network not far from where I live. Can I connect to it? The most commonly available network in Orne belongs to France Télécom. This private operator has undertaken to provide FTTH for people living in the Alençon urban community and in Flers. Where there are no private initiatives planned, the authorities have to invest to roll out solutions suited to the uses Orne residents make of the internet (optical fibre network or other technologies). If my line is too long, how else can I get internet access? WIMAX: Orne has a network with speeds reaching 4 Mbit/sec. To find out whether you are eligible or not, phone 09 87 87 00 00 (operator: WIBOX). The wireless local loop (WLL): in le Perche, where there is a local loop reaching speeds of 6 Mbit/sec, managed by the operator R’LAN. Call 02 43 82 97 82 to find out if you are eligible. Satellite: this technology is, in theory, available across the region, and has theoretical speeds of up to 20 Mbit/sec. Is there any financial aid to help me get equipped? Yes. Orne Council helps with the equipment and installation costs, if you opt for WiMAX, WLL or satellite. See questions concerning Internet over radio waves. Orne is an innovative council. Why doesn’t it bring in fibre optics for everyone? Because it would cost €287 million! As a comparison, the Council’s total budget comes to €384 million a year, for its various functions such as paying RSA benefits to 7,800 households, paying out aid to senior citizens, building and maintaining roads, bridges, school transport, managing secondary schools, etc. What is the best internet connection available today? FTTH: Fiber To The Home. Fibre optics give the fastest speeds, regardless of distance and data volume. However, its roll-out means heavy investment from operators and local authorities, especially in rural areas. We just have to be patient! When will I get fibre optics? Let’s turn the question around: what speed do I now need? Orne Council’s digital masterplan taskforce is on hand to provide a detailed answer. A range of technologies are on offer in Orne, one of which will probably suit you. 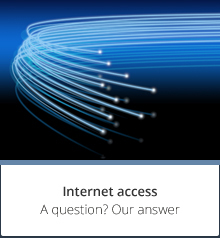 Why am I not eligible for high-speed internet (over the telephone network)? I can’t even get a box and a triple play offer! Your telephone line must not exceed 2.5km long. Otherwise it won’t be able to carry these services from the exchange up to your home. France Télécom and Orne Council are working on the shortening of telephone lines to increase data transmission speeds and thus open up access to the services offered by operators. Can my company get financial aid? As part of the Orne Digital Masterplan, Orne Council has introduced a system of grants to help businesses cover the cost of internet access in areas where the copper network is not compatible with ADSL. Pending the bandwidth upgrade and the very high-speed local loop, Orne Council will cover a share of the cost of fitting satellite, Wimax and wireless local loop technologies (such as R’Lan). This aid is limited to €150 or €450, depending on whether or not beneficiaries purchase the connection kit. This policy aims to give everyone access to satisfactory speeds using wireless solutions. The replacement of equipment already subsidised by the Council, but which has since become obsolete (due to a change of satellite) is also eligible. Satellite dishes and other devices taken down can be recycled at waste collection centres. Orne Council also covers a share of the work required to for ADSL access for companies who will not, in the short term, benefit from the initiatives included in the Orne Digital Masterplan Orne Council thus offers a grant worth 30% of a maximum budget of €50,000 excl. tax, i.e. a maximum grant of €15,000. This is available to small, medium and large companies, and to tradesmen and retailers. I’ve heard about remote working via the internet. How might this affect my company? Remote working means employees are able to work for their company away from the office, either at home if they have sufficient bandwidth or in a telecentre with a high-speed or very high-speed internet connection and secured data systems (8 sites now open in Orne). Is there a special organisation I can contact for advice? What does “access fee” mean? Does it mean the civil engineering work and materials or subscription? The access fee is the cost of building the portion of the fibre optic network and the related civil engineering work between the business park (or the nearest hub for an isolated company) and the company’s technical facility. 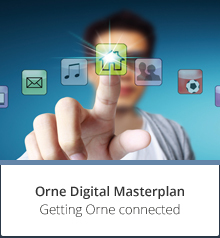 What does the Orne Digital Masterplan include for businesses? It includes very high-speed access for business and industrial parks and the consideration of individual requests coming from companies. For example, where there is no or insufficient ADSL access, or for a company that is isolated, not located in a business park, etc. What technology can my company use to connect to the very high-speed network? (which gives operators access to Orange’s wholesale offer), it already has access to a very high-speed offer regulated by the ARCEP. 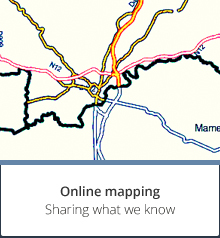 The Orne digital masterplan is not applicable in this case (14 towns and villages concerned on June 1st 2013: Alençon, Argentan, Caligny, Damigny, Domfront, Flers, L’Aigle, La Chapelle-d’Andaine, La Ferrière-Bochard, La Ferté-Macé, Mortagne-au-Perche, Sées, Vimoutiers. the Orne digital masterplan includes plans to connect you to the very high-speed network. However, depending on exactly where you are and the distance from the telecoms equipment, you will be connected using fibre optics or a microwave radio relay system (very high-speed wireless link) running up to your company. The choice will depend on the estimated cost of connection. Why are professional service offers more expensive? Depending on their activity, professionals need faster speeds and better service quality (guaranteed, symmetric upload and download speeds, shorter maintenance and repair times if the system goes down, etc.) Prices are thus adapted to cover this, like the operators’ business offers. Will I be able to choose from a range of operators’ offers? You will find the answer on www.degrouptest.com. Competition varies across Orne. Operators are more attracted to the towns than rural areas. This is why, for each investment granted, Orne Council endeavours to invite a number of competitors to use the infrastructures provided. Can I get financial aid if I opt for WIMAX or the wireless local loop? Just like for satellite technology, Orne Council subsidises the installation (50% of the cost). For both of these technologies, the equipment is systematically rented out and remains the property of the operator. Can my village/town council help me with all of this? It is always important you go to the village/town council (mairie) to find out about the facilities and infrastructures available for high-speed and very high-speed connection. They will be able to tell you the name of the local digital advisor available to help you, in liaison with Orne Council. Does satellite technology work everywhere? In theory, yes. But you should be aware that if you are located at the bottom of a valley, surrounded by evergreen trees or near a river, the radio signal may be disrupted or interrupted. I got a grant from Orne Council to fit a satellite dish in 2008 (or 2010). At that time, I used the ASTRA satellite. Now there is another satellite, EUTELSAT, which offers better speeds. How can I switch my internet access to this satellite, and how much will it cost? Purchase of the connection kit: an Orne Council grant of €300 for the satellite dish. Installation: Orne Council will cover 50% of the costs. I’ve heard about 4G technology for internet access via a mobile phone or tablet. What is it? 4G is another form of radio technology. It enables peak speeds of 50 Mbit/sec in certain conditions (low signal sharing, location near the transmitter). It can provide a quality solution for limited use and in low density areas, but it cannot be compared to a fixed optical fibre or copper network. Roll-out is just starting in France. 40% of Orne will be covered in 2017. If I buy a satellite dish and I have problems with it, who will pay the repair costs? You, as owner of the equipment. This is why it is worth comparing the cost of acquisition with the cost of hiring the satellite dish: www.internetparsatellite.net. What do I do with my old equipment? It must be recycled at the nearest waste treatment centre. What do I need to do to benefit from Orne Council aid? You need to send Orne Council the invoice for the purchase of the connection kit (satellite internet access) and the invoice for installation carried out by the aerial fitter. When is Orne Council aid not possible? If your town or village is affected by a public bandwidth upgrade or FTTH initiative in the six months following your application, it will be rejected. Check this with your town/village council or Orne Council. Where can I find an aerial fitter? In the Yellow Pages from France Telecom or your phone operator.